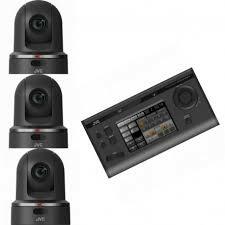 The KY-PZ100 is a robotic pan, tilt and zoom video production camera. 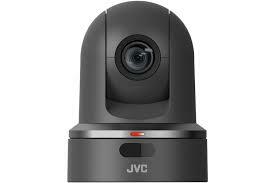 It’s the first PTZ camera that features JVC’s unique IP communications engine providing network connection via WiFi*, 4G-LTE*, or cabled LAN. It’s designed to be used as a stand alone remote camera or as part of a multi-camera system in both studio and field environments. 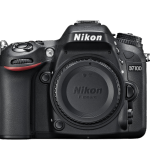 In addition to its 3G-SDI and HDMI outputs, it is also capable of reliably streaming 1080i/60, 1080p, 720p, and 360p video with 2-channel audio–all with minimal latency and forward error correction. 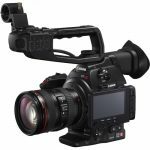 The Canon EOS C100 Mark II Cinema EOS Camera with EF 24-105mm f/4L Lens combines the compact 1080p EOS C100 Mark II camera with a versatile zoom lens that covers medium-wide to telephoto focal lengths on the camera’s Super 35mm-sized CMOS image sensor. The EOS C100 Mark II is an updated version of the C100 that incorporates Dual Pixel CMOS AF technology that enables continuous autofocusing with compatible Canon lenses. This provides faster and more accurate autofocusing to assist users when operating with small crews. 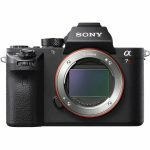 With a world’s first full-frame 42.4-megapixel Exmor R back-illuminated structure CMOS sensor, the Alpha a7R II Mirrorless Digital Camera from Sony is prepared to take mirrorless imaging to another level. This sensor design both improves low-light operation and speeds up data throughout, enabling fast high-resolution stills and UHD 4K video recording. Working with the BIONZ X image processor, these images can be produced at sensitivities up to ISO 102,400 and at a continuous 5 fps shooting rate. Five-axis SteadyShot INSIDE image stabilization has also been implemented, compensating for vertical, horizontal, pitch, yaw, and roll movements. 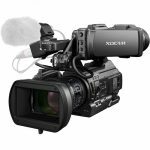 The Sony PMW-300K1 XDCAM HD Camcorder from Sony is designed to meet the demands of field video productions and professional studio applications. It is Sony’s first semi-shoulder mount camcorder to combine the low-light capabilities of three, 1/2″ Exmor Full HD CMOS sensors with the broadcast-quality, Full HD MPEG HD422 codec. The camcorder features the same rugged metal construction, interchangeable EX lens mount, and 14x Fujinon HD lens as the PMW-EX3, but introduces advanced signal processing technology for low-noise and clearer images. The PMW-300K1 also features a 3.5″ 960 x 540 LCD viewfinder, built-in ND filters, and 8 assignable function buttons.